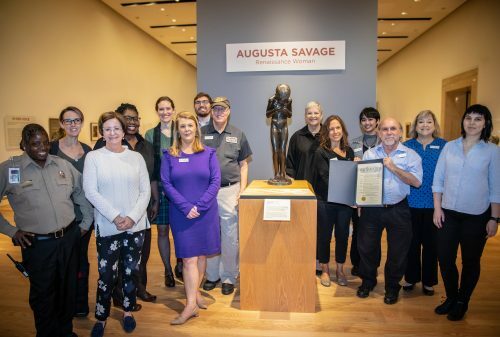 The Cummer Museum of Art & Gardens announces Mayor Lenny Curry has proclaimed February 2019 as Augusta Savage Month in Jacksonville. The Cummer Museum is currently featuring Savage’s work in its exhibition “Augusta Savage: Renaissance Woman.” February is also the artist’s birth month and will be the United States’ 43rd Annual Black History Month. Savage, a Green Cove Springs native, became an accomplished sculptor and is widely considered a core figure in the Harlem Renaissance. Savage faced racism, sexism, and discrimination throughout her life, which hampered her commercial pursuits. The “Augusta Savage: Renaissance Woman” exhibition is the largest ever organized by the Museum and the most comprehensive exhibition highlighting Savage’s unique story. The exhibition includes sculptures, watercolors, historical photos from Savage’s life and career as well as historical artifacts and the works of her students. Savage (1892 – 1962), a female sculptor, overcame poverty, racism, and gender discrimination to become one of this country’s most influential artists of the 20th century, playing a pivotal role in the development of some of this country’s most celebrated artists, including William Artis, Romare Bearden, Gwendolyn Bennett, Robert Blackburn, Gwendolyn Knight, Jacob Lawrence, and Norman Lewis. A prodigious and highly-acclaimed artist in her own right, Savage achieved excellence through talent, self-determination, and vision, ultimately creating sculptures and large-scale commissions that elevated positive images of Black culture into mainstream America. She was the first Black woman to open her own gallery, challenging exclusive arts institutions to recognize the talent of Black artists. As a community organizer and teacher, Savage’s commitment to mentorship and education became a model for other art schools run by the Works Progress Administration (WPA). Savage is best known for “The Harp”, her commissioned sculpture for the 1939 World’s Fair, and is recognized in American Black history as an educator and important community leader. “Augusta Savage: Renaissance Woman” can be viewed and enjoyed with regular Museum admission through April 7, 2019. The exhibition includes 80 total pieces including 19 sculptures and a watercolor by Savage. Admission is free for anyone in the community on Florida Blue Free Tuesdays from 4 to 9 p.m. every Tuesday evening and again on Weaver First Saturday Free for All, held the first Saturday of each month. A full companion program and events calendar is available here.